Ohh! I forgot to post Today's Flowers yesterday. Well, here's my contribution for this week, a beautiful and sweet cream white marigold flowers of our neighbor. 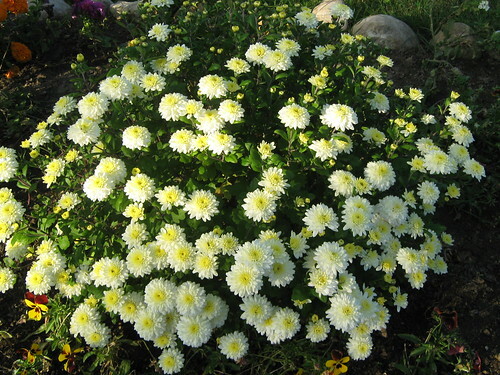 These kind of flowers are very common and easily grown during summer and ends during fall. Thanks to Luiz Santilli and Denise BC for hosting the site. If you love to participate feel free to join and don't forget to add your name in the auto link. God bless you all. Such pretty, delicate flowers! They look so beautiful in such a large clump! Are beautiful and graceful as you, excellent choice for this week. I thank you for participating in another edition of the FT.
Those are so pretty! I wouldn't mind a bunch like that in my yard.